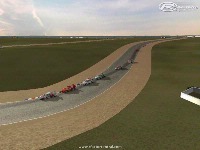 High Plains Raceway is a new track near Byers, Colorado, USA, scheduled to open in Spring of 2009. The track has been paved, and this simulation was made from blueprint, video and GPS data recorded while driving the new asphalt. Built on the rolling open prairie, it is 2.55 miles long, with 15 turns and roughly 80 feet of elevaton changes. HPR is the only facility in the country which was conceived, financed, designed and built by a collection of amateur road racing clubs and their members. There are currently no setups for High Plains Raceway. Add a Setup. Do you love Racing Games? 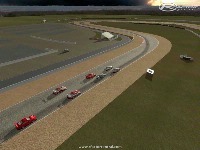 Visit http://www.kizifan.com/ today and play free racing games online and more. Visit us today! Any updates for this track? If you pass through the pits your lap doesn't count. We did a league race here and it was all messed up because pit stops put you a lap down becuase you don't trip the lap counter in the pits. Also pointed out already the lack of starting lights. That's no big deal though. The other problem is one of our guys DNFed and when he exited the race it put his car on the grid rather then in his garage. Otherwise this track is a blast. Thanks for building it for us. Having run HPR 10 times this summer in my 72 911 RS clone, I can tell you that you did a VERY accurate job recreating this track. All the elevations seem to be spot on, and most lines are correct, or near correct. The esses at the end seem a bit funky, but I can't place what seems off. I think the entrance may be a bit wierd, but it could be just me. Thanks alot for incorporating my home track. Hopefully I can get a leg up on the real competition this winter. Thanks. We've raced on it a time or two, and the real track is very similar to the simulation. The corners feel sharper in real life, but I think that's a product of actually being in a car with braking and turning forces, etc. Real life lap times are within seconds of simulation times. Not sure about the odd cars on track you're getting ... I can't recreate them. I do get cars that crash into the pit wall and get stuck there, but no one just lines up and stays there. Great track.. Nice job. In practice and qual I get a couple of ai cars that camp out on the start finish line. Was that ever addressed? I wonder of its a pitlane entrance issue.. not sure. You know what would be cool graphically: if you have that occasion semi going down the highway in the background; or those birds that seem to be fluttering around all over the place. Just like in the real life video. AI stand for Artificial Intelligence , in a race car game it refers to cars you can race with that are driven by the computer--the higher an AI rating the better they drive. In other games, like a shooter game-AI determines how good the computer opponents are. I am new to video games/simulators, so forgive my ignorance. What is an AI? I have also noticed the lack of lap data after a pit stop, any way to switch back to lap data? I can only imagine how much effort went into this, nice job. I bicycled this track in October? and it is exactly what I remember. My wife and I took a three day driving school at Miller in September and the feel from the seat is as close as you can get without actually driving. Oh .. good catch about the pit count. I'll look into that for next release. As for the lights ... toggle your on screen data display to the lap counter, and you can 'go' as soon as it starts counting. Not elegant, I know, but I'll work on it.